When it comes to landscaping designs, there are so many great ideas out there to choose from. 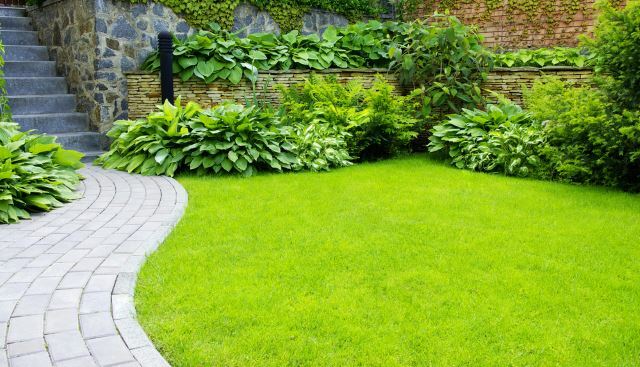 One of the most important things you need to keep in mind before starting a landscaping project is the size of the area you plan on landscaping. Do you have a very large yard or a small side garden? Do you own a home or are you renting an apartment? Whatever the size of the yard space you’re going to landscape, there are plenty of ideas here to get you started on the path to your dream garden! Keep reading for lots of cool ideas, strategies and layout ideas so you can start planning your own! If that classic English garden is your goal, this is a great strategy plan! The blooming terrace entryway and the wonderful blooms along the dirt path are classically country. 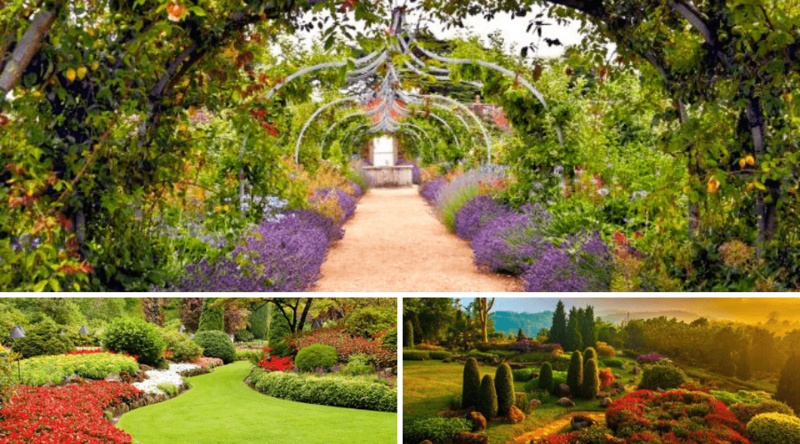 England is known for their luxurious gardens since they have the perfect climate for some of the most gorgeous plants known to man, but if you want to create the same, lush landscape, try finding native plants in your area that are sure to thrive and blossom no matter the climate. Imagine walking down a winding path through this oasis in the early morning? Hillsides should always have blooming gardens on them, I feel. 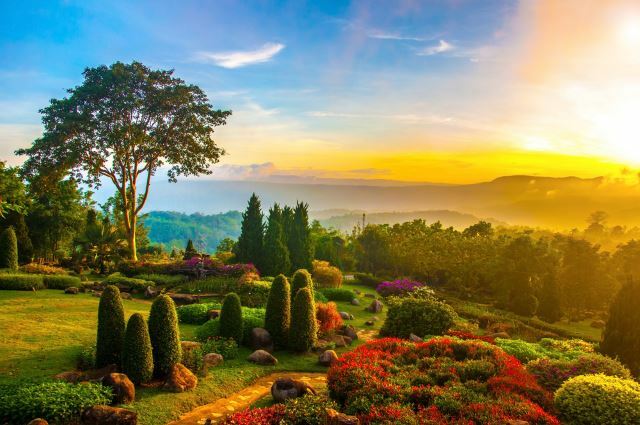 If you have a bald hillside or a domed area you’re not sure what to do with, you could easily create your customized hillside garden by planting trees and bushes straight into the ground or by utilizing raised garden beds. Whichever method you plan to use, organization is the key. You don’t want a messy plot, after all. 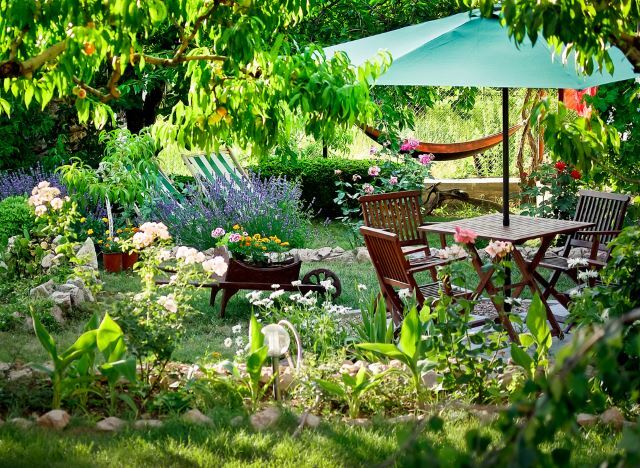 This colorful, lush yard is the perfect setup for the spring time. Unfortunately, seeds don’t sprout into gorgeous blooms overnight, but if you plan ahead and scale out a design you could easily achieve this beautiful look by the time spring has sprung again. The wavy garden beds can be kept clean by runners or seed paths that help you determine which way you’d like your plants to sit. Leaving a grass path, as depicted in this photo, can add some canvas color to the scene. Give your yard a clean look by incorporating a path of stones. This makes the perfect walking path for guests to easily view all your colorful plants without harming grass or getting mud on their shoes. It’s both beneficial to your guests, to your plants and to you for when you need to do some backyard watering. You can choose any style of brick to create a path and if you’d like to leave space in between stones, you can either fill the gaps with filler rock or pebbles, or just leave a wider space in between stones to resemble a large stone footpath. Give your outdoor area some character by using colorful ceramic pots. Pots come in all shapes, sizes and colors, so you could easily choose a few pots that would bring extra life to your backyard area. Pots are also an easy way to construct a theme without having to use too much extra material or decoration. Want to keep the garden looking rustic? Get some adobe or unpainted clay pots to give the area that rustic feel without having to create a whole decorating strategy plan. 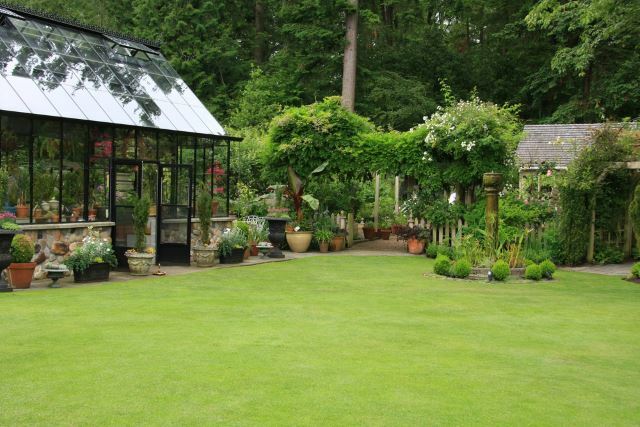 Utilize your outside space by adding a greenhouse into the mix. Whether you have room for a large greenhouse, or need to stick to a smaller one, a greenhouse can house all kinds of different plants you may not necessarily want out in the open. This is also a great way to make your outdoor space more elegant. Get creative with your greenhouse – add little lights around the inside or outside and add some completely unique plants you think most people haven’t seen anywhere else. It’s pretty much always tea time in this gorgeous country garden, or at least it should be. The table and chair set is right in the middle of the lushest part of this gorgeous scene. With so many great garden attributes, this would be the perfect setting for any kind of occasion. You could easily seat more people in this area by adding a larger table or maybe even a few more chairs. Since the scene is already so quaint, it’d probably be best to keep the furniture at a minimum not to distract from the awesome scenery. Make your oasis unique in creating an interesting covered path like this one in the picture. Although technically it shouldn’t be considered a covered path, the pathway is marked by an interesting structure above it. It’d be great to add little lights to this kind of yard feature to make the pathway sparkle at night. It’d also be an easy addition to decorations if you’re hosting an event. If you have creeping vines or ferns growing in your plot, utilize a structure like this to have the plant start to grow onto it. This would create an all-natural covered pathway. 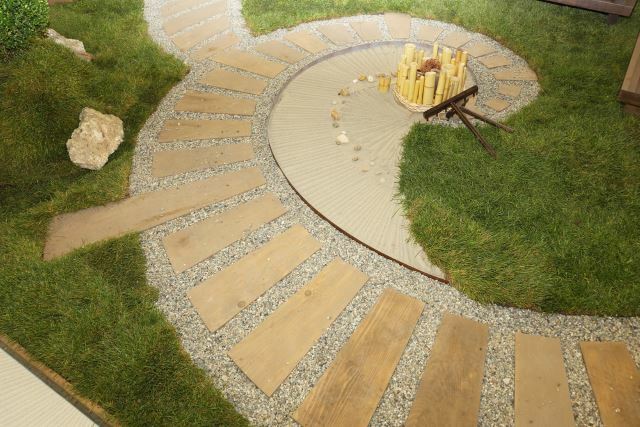 Make your garden a Zen space by creating spiral walkways. Using garden stones or bricks, you can easily create different shapes or spirals to give your outdoor area that peaceful, serene vibe. Much like sand gardens, areas like this are meant to help make you feel centered and relaxed. The best part about these Zen spaces is that there is no sand required. No sand equals no mess. The stone or rock pathways will hold up through wind and rain, and just look plain awesome. Don’t have a lot of space to work with? No worries at all. This vertical idea is the perfect way to utilize a tight space and still give you a pretty great outdoor scene. Essentially this plot has sort of a stacked design, placing each of the plants on top of each other. They are separated by tiers, and are typically super easy to maintain and water. Mix up the scene by creating a blooming wall for all your friends to enjoy. You can really get creative with the colors in this design. 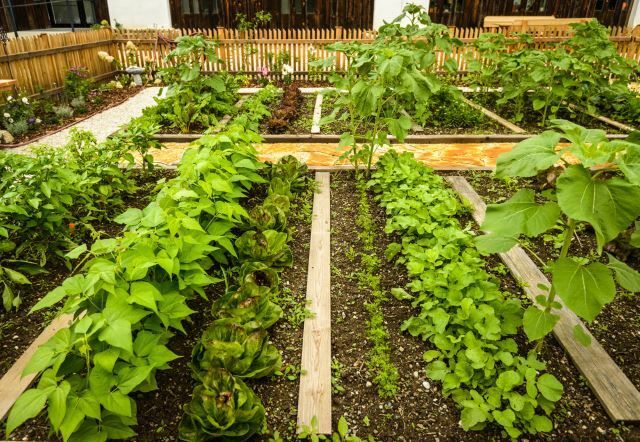 Create your own edible oasis that doubles in beauty and sustainability. 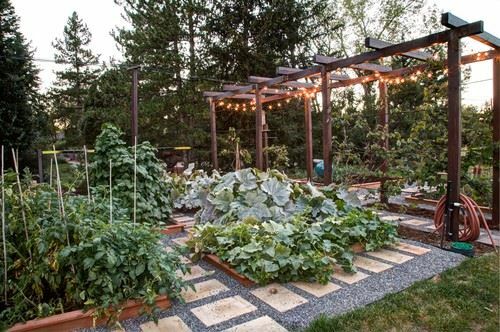 Backyard gardens are highly popular right now and they are definitely a trend that is here to stay. Imagine a garden overflowing with color. Vegetables in general are colorful, but by adding fresh herbs and plants you can literally create a kaleidoscope of edible color. Deep greens, vibrant reds and bright yellows are just some of the colors you can see in your own edible garden landscape. Make sure you plant your plot seeds accordingly, however, as certain fruits and vegetables need specific times to be harvested. When you are trying to landscape a bigger area, make the most of your space by creating sporadic plant beds. Instead of having to cover a lot of area at once, you can easily save time and money by creating smaller plot clusters. Not only will this give your outdoor space a clean look, you won’t be overpowering the area by using too many plants. You definitely can have too much of a good thing when it comes to plants, so this is a sure way not to overdo it. Make your outdoor space a work of art by incorporating some interesting statues. Whether it’s a large focal piece, as depicted, or a few smaller interesting elements, you can liven up the feel of your plot by incorporating some art into it. You can also go as far as having a specific piece custom made for you if you know an artist that does welding and specializes in outdoor sculpting. As with most of these ideas, you can get as creative as you want with this concept. Create a customized landscaping job by incorporating bricks into your garden. Brick paths can easily be used to separate certain plants or areas in your garden from each other, and create a pretty impressive walkway. You don’t have to worry about raise planting boxes or garden beds by utilizing this method since everything will be organized, just in the ground. You can get as colorful or unique in the brick layout as you please. You could even add a watering system easily by using PVC pipe for a sustainable garden that wouldn’t cause you a hassle. 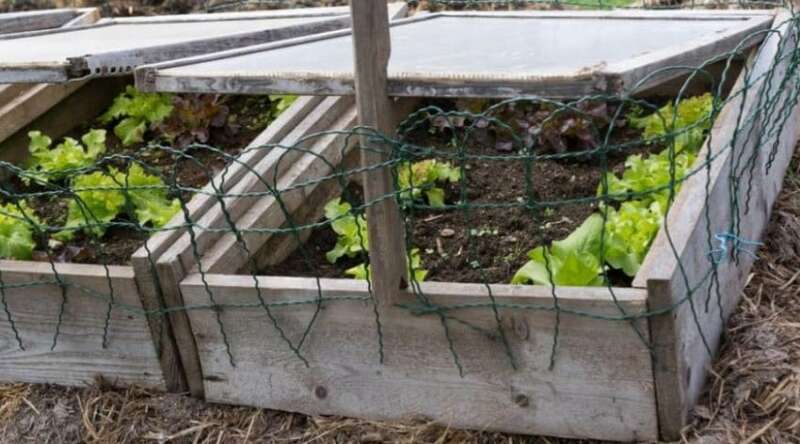 This odd, but effective, set up is the perfect way to separate vegetables without having to create raised garden beds or fencing your veggies in. 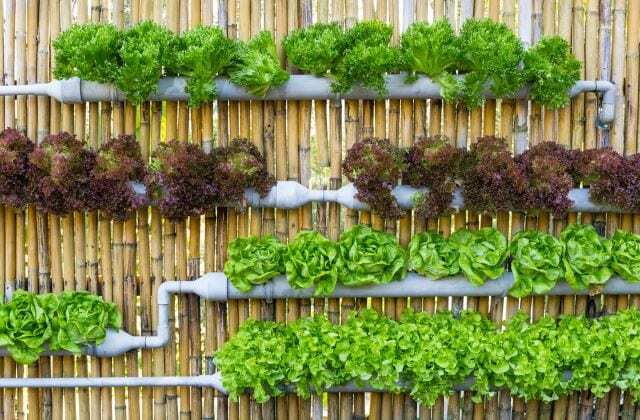 Not only is this a smart hydroponic system, but this is the perfect idea for those who want to embark on a sustainable lifestyle by growing their own food. Whether you have a very large area to cover or even something as small as an apartment side garden, you can easily cater this design to fit your growing needs. 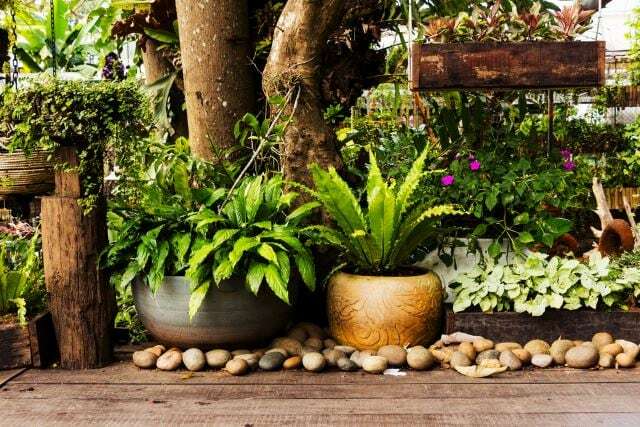 If you have a large outdoor space you’re not sure what to do with, easily make it a little oasis! 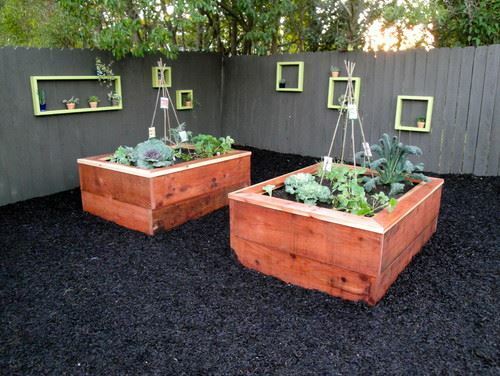 Even if the area is paved or has cement, you can easily create yard boxes to house all sorts of vegetables and herbs. Of course, using plant boxes isn’t limited to edible plants – you can have all sorts of flowers or bushes, depending on what you want to utilize that space as. Better yet, you can easily move your boxes around instead of having to uproot a plant from the ground. 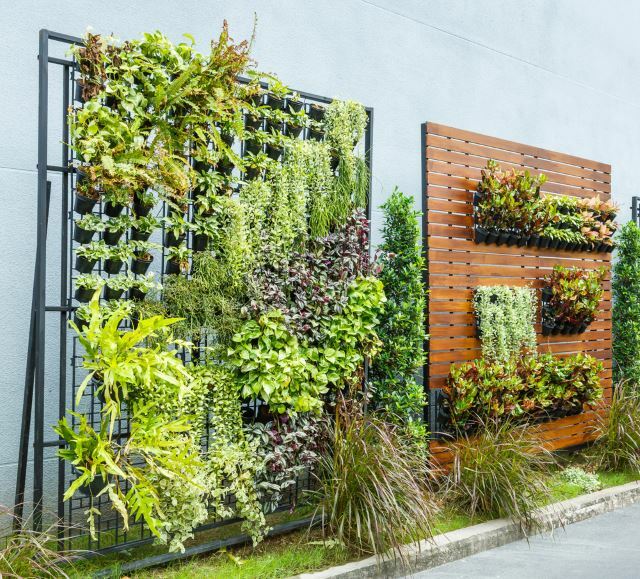 A wall garden or vertical one is the perfect way to grow some of your favorite veggies without taking up so much space. 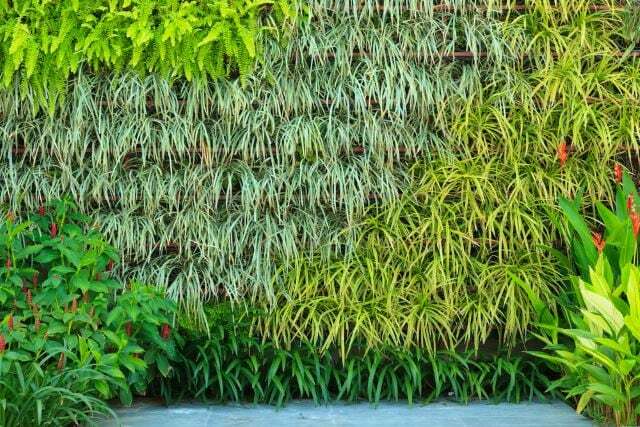 The plants are easily situated into a wall space and are right there for whenever you need them. Imagine not having to run to the store any time you needed fresh basil or tomatoes? This is a great idea for a smaller space or even an apartment setting. Given the amount of plants you plan on harvesting, you could also install a self-watering system. A hydroponic set up is a system sustained by a hydroculture method which uses a nutrient rich solvent instead of soil. Imagine not having to deal with messy soil at all? This method may be a bit trickier, but in the long run it will save you time and hassle. 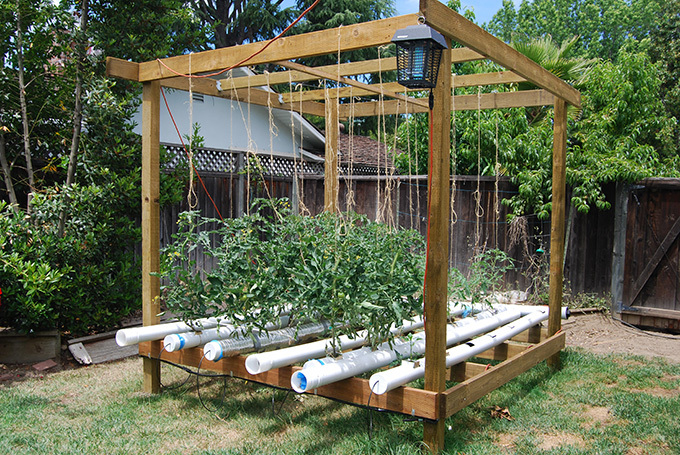 Using a system of pipes, such as PVC pipe, you can run a series of rows that have holes in them so the roots are exposed to the water mixture and the plant is free to grow outside the pipe through the hole. It’s a unique method that will save you time and space. 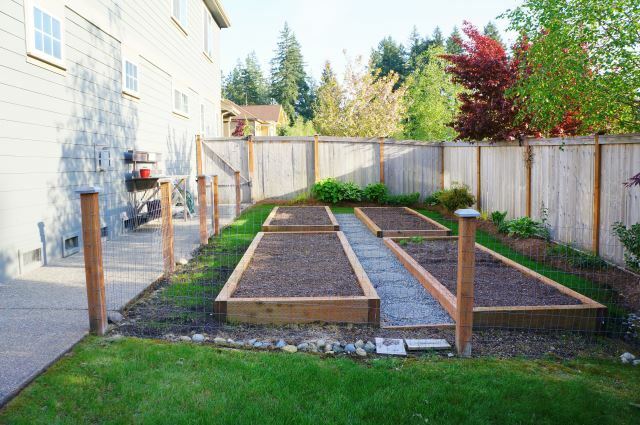 Raised garden beds may seem a bit difficult at first, especially if you’re planning on constructing them yourself, but they really aren’t that hard to build and even easier to maintain. Instead of planting in the ground, these boxes help protect your plant and they can be easily moved given the weight of the box. Once the box is constructed, you simply fill it with dirt and plant away. Depending on how fancy you want to get, you could also install a self-watering system. What a picturesque scene this is! Imagine looking out your kitchen window to this wonderful garden and quaint little cottage in the background. You could easily create your own garden viewable from your own kitchen. 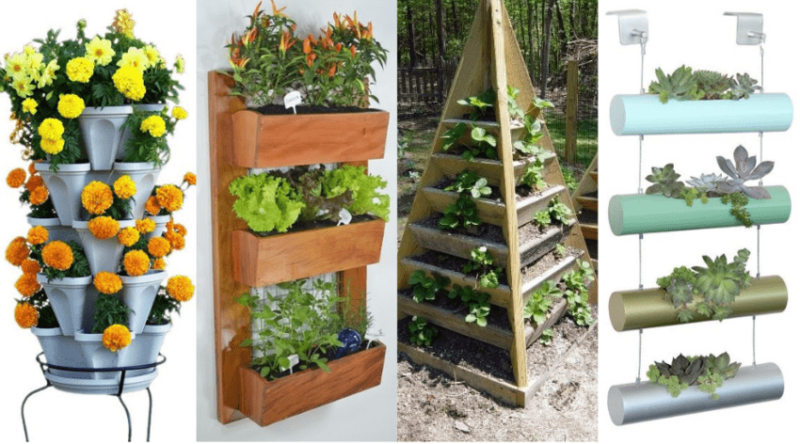 Not only will it be a fun process in growing your own vegetables, but you can make your outdoor garden a focal piece. It’d be great having something as pretty as this garden in the photo to look at while doing dishes or other kitchen chores. 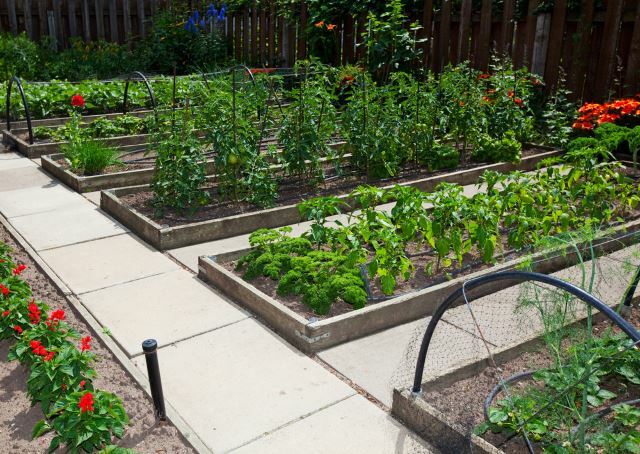 Even if you’re growing vegetables, that doesn’t mean your garden has to be specifically for that. 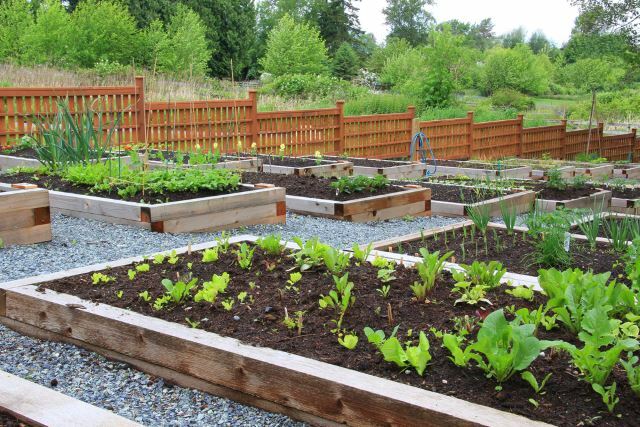 You can easily make your veggie garden beautiful enough to relax in by using different kinds of organization elements. 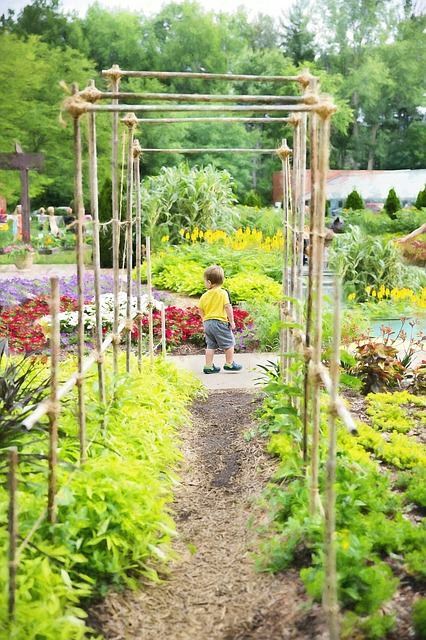 The trellis in the back of this photo gives the garden character while serving a purpose. 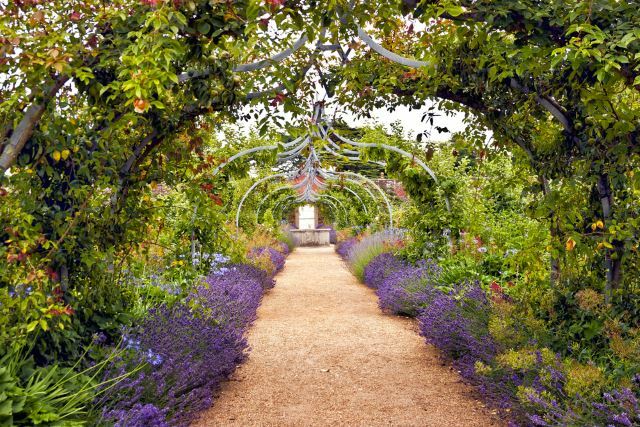 You can grow any type of flowering vine or grapes on a trellis like that. 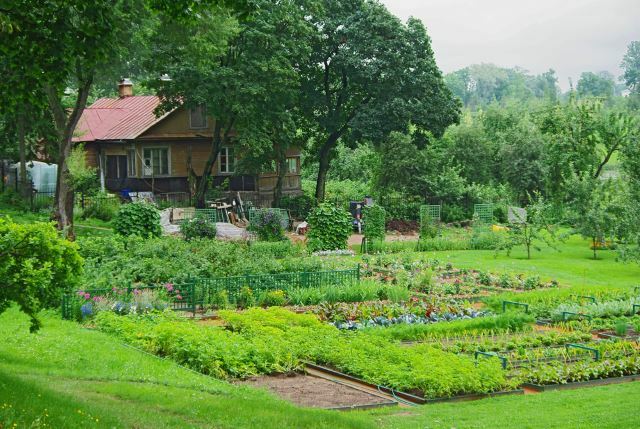 The garden in this photo is clean and organized, which gives you a feeling of satisfaction. Help protect your garden from unwanted visitors like opossums or rabbits by installing a fence around it. It doesn’t matter the space of your outdoor area – if you have a small garden, you’ll just need a smaller amount of fencing. If you wanted to protect the garden from birds, as well, you could easily cover the top portion of the garden with more wire mesh or fencing. Of course, the larger the area you’re fencing in, the more support you’ll need. You may want to install a support beam in the center to prevent the mesh from hanging down. This well-organized garden was clearly thought out beforehand. 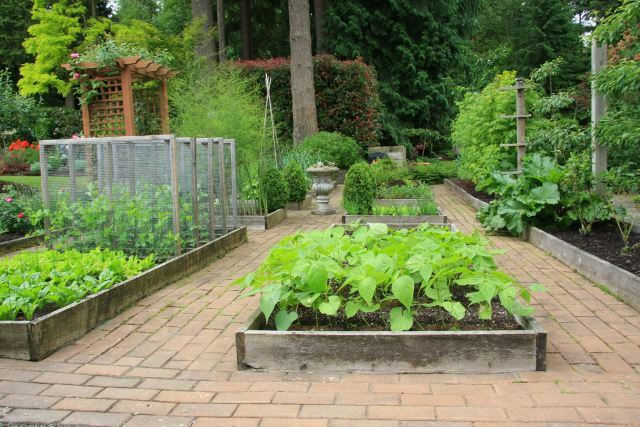 Plants do need room to grow, so it’s important you scale your garden area appropriately and organize it accordingly. If you haphazardly plant your seeds, the plants will grow that way, as well. You don’t want overcrowding to occur, so make sure your rows are neat and straight. Your plants will thank you for the consideration by growing big and tall. They’d definitely supply better produce, as well. It’s worth a little extra planning at the get go. Here’s a perfect example of decorating your garden so it can double as a focal point or even a space to find relaxation. The wooden pillars and fencing provide shelter to your garden and also double as a well-organized space to relax in. 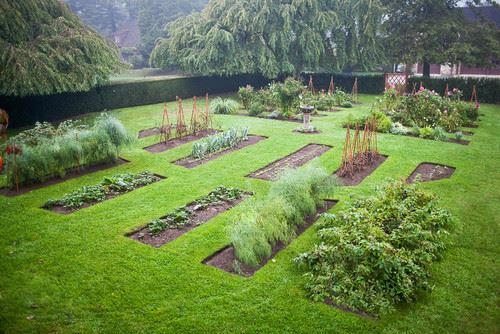 Who wouldn’t want to tend this garden when everything is so precise and organized? It may take a bit extra work, but as you can see, it’s totally worth it in the end. 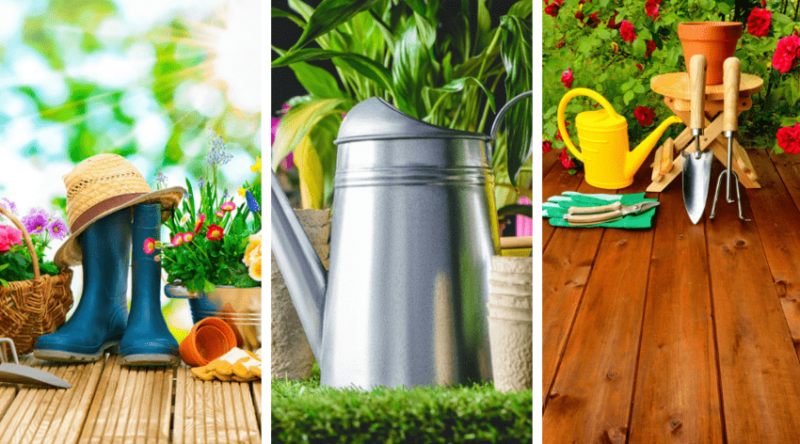 Any outdoor space would look infinitely more put together with a well-organized garden. 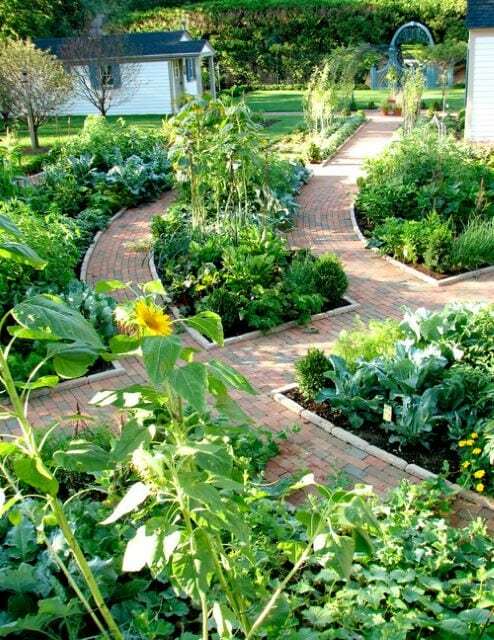 Using brick or stone, create your own winding curved garden paths that cut right between your blooming plants and produce. It’s a great way to keep your plants organized and an even better way to keep your shoes clean from watering and tending to the garden. 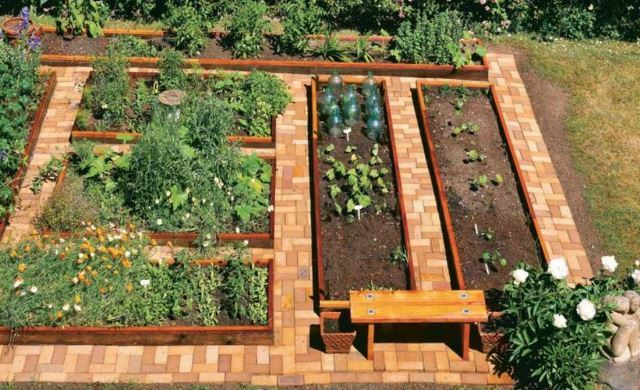 You could even utilize garden boxes with a layout like this, you’d just need to make sure the boxes were just the right size so there wouldn’t be any spillover or space between the box and the walkway. 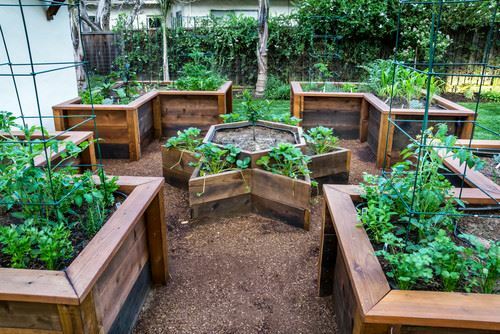 As if raised garden beds weren’t impressive enough, you can form them to create artistic shapes or designs in your outdoor space. This is a great way to add some decoration to a smaller space or just a great way to make your garden completely unique. Whether you get them custom designed or you want to create them yourself, these garden boxes are sure to be the center of attention at your next patio party or garden shindig. Adhering to the concept of raised garden boxes, these water troughs can double as a pretty interesting addition to your outdoor space. The beauty about this idea is that there is no assemble required since water troughs come ready made in all sorts of shapes and sizes. Don’t limit yourself to water troughs – any type of container could be used, really. Just keep in mind that certain materials like tin or metal can rust over time when exposed to the elements. 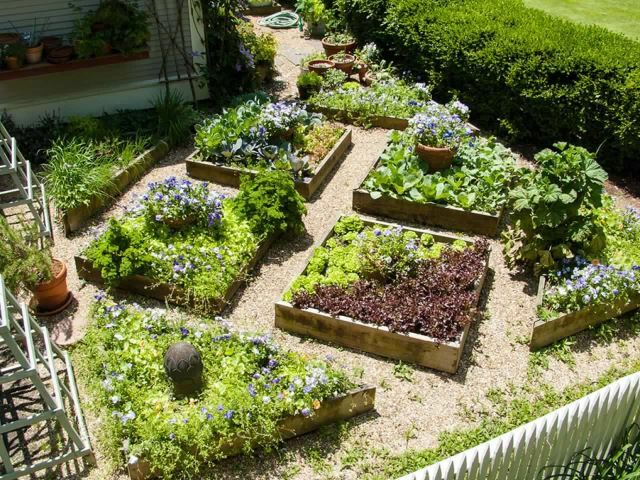 I love this garden idea because it looks as if the garden beds have just been cut out of the earth. I guess essentially, they have. 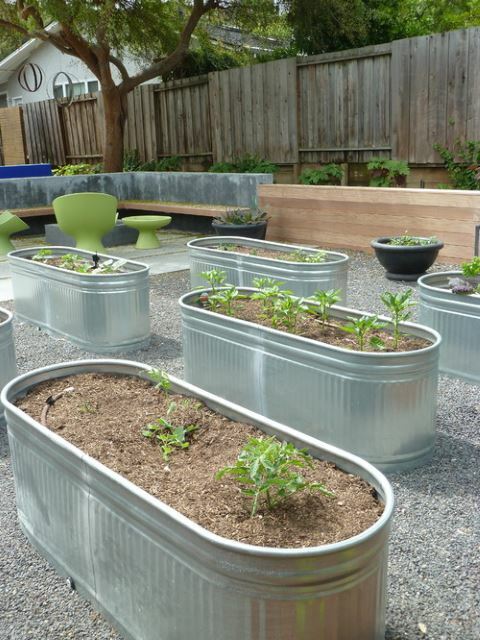 This is a unique and fun idea for growing plants in the ground instead of using garden beds or raised garden boxes. Get creative with the shapes and sizes you want to use in this type of garden layout. Just remember extra tending would be in order to prevent any grass from spilling over and growing into the actual garden area. 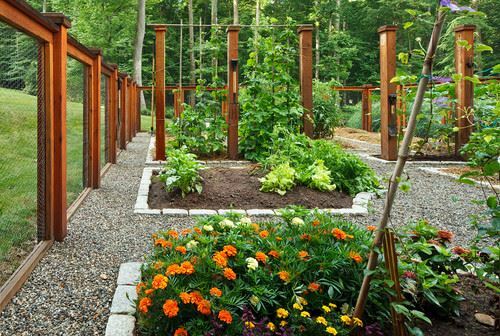 This is a great idea for a simple renovation to a pre-existing garden or even a great demo for a future garden plan. The little lights on the walkway structure make the garden look almost fairy-like. The garden stones look as if they are shining in the setting sun, making the whole scene dreamy and pleasing to look at. This is a great example of what you can do with an outdoor space and how gorgeous simple attributes, such as those lights, can be. This is a great concept for livening up a garden area! Using frames, easily showcase smaller potted plants or cactus in them. Succulents and cactuses would probably be best for this since you can find relatively small plants, but you could essentially use any kind of plant. Just make sure the plant wouldn’t be too heavy and fall off the frame. Get funky with the colors and play with the space. The dark flooring in this garden space really makes those frame colors pop. One of the most beautiful elements you could add to any outdoor space is a water feature. Water features don’t necessarily need to include fountains, or even rushing water, for that matter. If you have the space, you could create a rock pond. 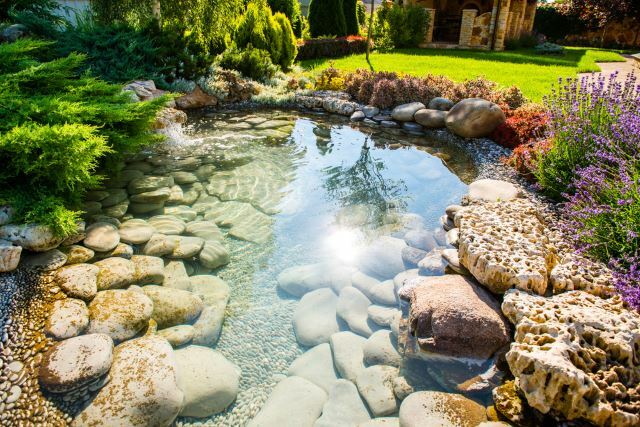 Ponds are a great way to incorporate an interesting element to your space and you can get so creative with pond ideas. The large stones that make up this pond are gorgeous to look at and you guests will think so, too. Creating your own rock garden would be a great way to add a garden area to any part of your outdoor space. Using small garden stones or landscaping rocks, you can easily plant flowering bushes, like the ones pictured, to create a gorgeous space that is unique and fun. Adding larger stones into the garden will add a level of artistic intrigue and will certainly look impressive to anyone who visits your garden. The best thing about rock gardens is that you don’t need to landscape too often, unless it’s to weed out grass that decides to grow in between the rocks. 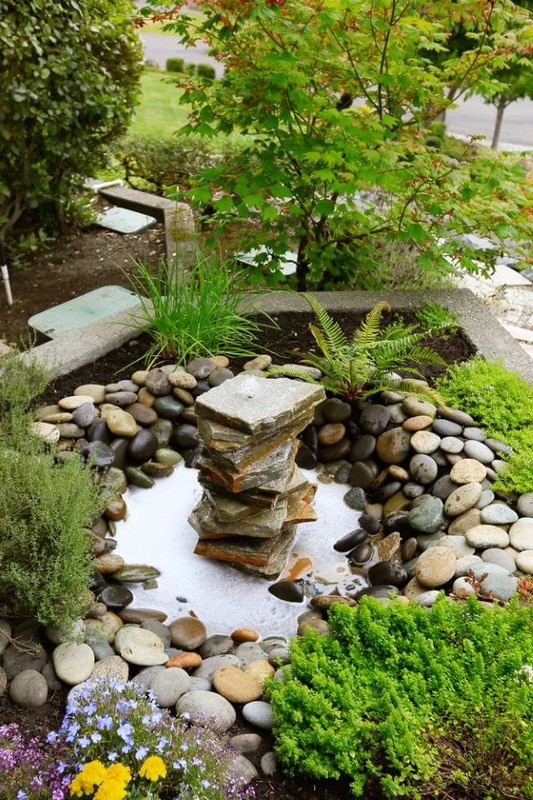 Create your very own garden waterfall by incorporating this feature into a stone pond. The fact that the waterfall is so tiny is not only cute, but it would be a great addition to all sorts of garden designs and spaces. The sound of moving water is naturally calming, so this would especially be a great addition to your next garden party or outdoor event. Thankfully most water features can be sized up or down depending on your space. Those huge boulders along the side of this garden stream seem to act as barriers between the water and the bank. This would be the perfect addition to a larger garden space that needs some sprucing up or a great way to add depth to a pre-existing water feature. 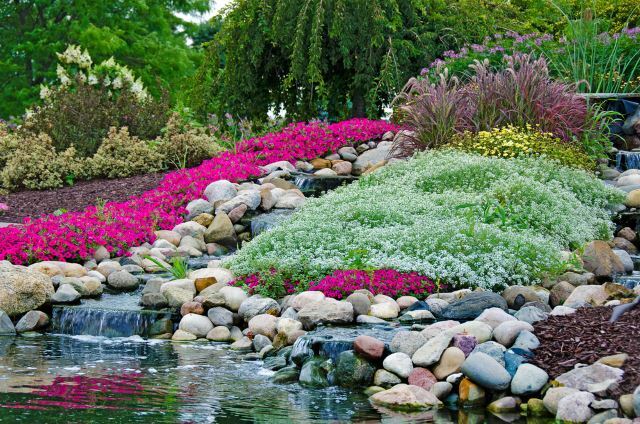 You would need a relatively large outdoor space to incorporate this rock stream idea, but if you have the space, it’d be a wonderful addition that would completely transform your yard. This rock fountain is not only a great way to add an interesting element into your garden area, but it’s absolutely adorable! This feature kind of reminds me of a wishing well, for some reason. Mostly since the rocks are surrounding a small pool of water that would certainly invoke some wish-making. Instead of a standard fountain feature, this one is comprised of those smooth garden stones that add so much character to the space. The water feature itself is made up of flatter garden stones – so unique! 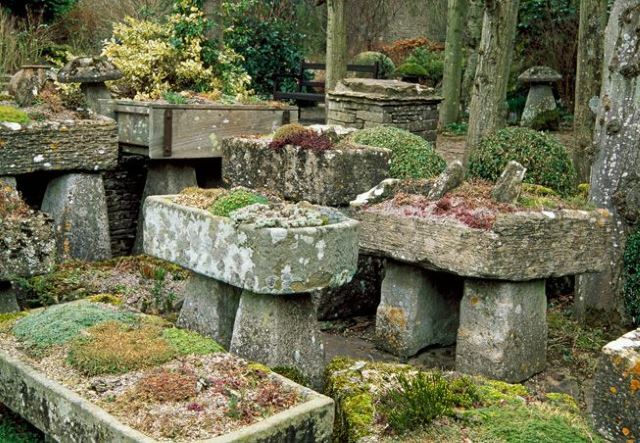 If you have a particularly difficult piece of land you can’t seem to fill or an area that is relatively devoid of sunlight inhibiting anything from growing there, why not create a stone garden? Playing on the artistic garden statue idea, these stone pieces would make an interesting addition to all sorts of spaces. The larger the area, the large the stones can be, and vice versa. You could even incorporate some smaller blooming plants into the rocks, too. From the stone garden tiles to the decorative rocks in the background, this scene is the perfect example on how versatile garden rocks can be. 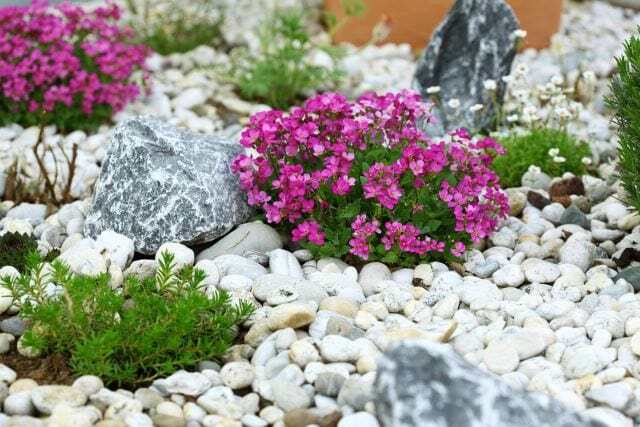 Using rock elements in place of turf or grass not only saves you time in landscaping, it’s also a modern way to freshen up an outdoor space. If you live in a more tropical area or near a beach, this could be the safest alternative for you in place of grass since tropical areas can be a bit more difficult to landscape. 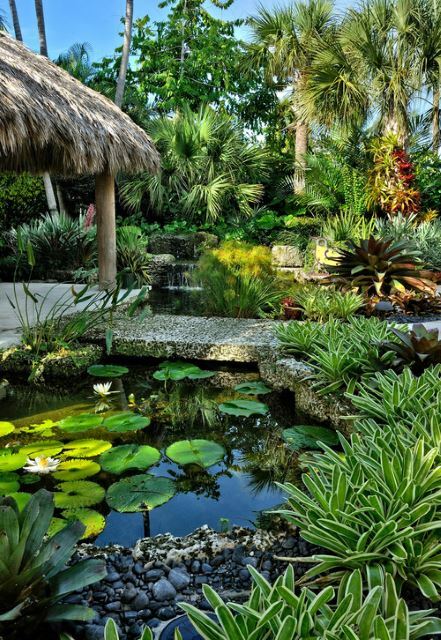 As mentioned before, tropical areas have a tendency to be a bit more complicated when it comes to landscape design. At least, complicated in the sense that you can’t plant many plants that aren’t native to that specific area. Since most of these places are in close vicinity to an ocean, the ground can be saltier and kill plants that aren’t sturdy enough to withstand it. 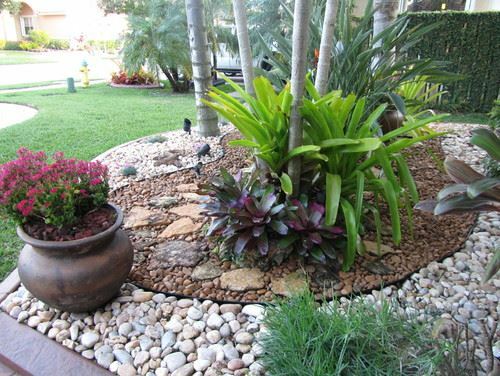 Help fill in those empty spaces in landscaping designs by adding rock filler to create a unique tropical garden. You don’t have to travel to Asia to mimic their adorable garden ideas. Bring Asia to your home by incorporating elements distinct to that country. 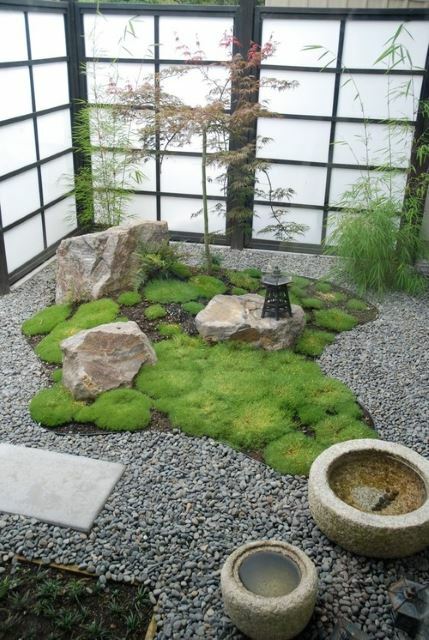 Most Asian cultures have in-house garden areas that feature smooth rocks, small streams and plenty of bonsai trees. 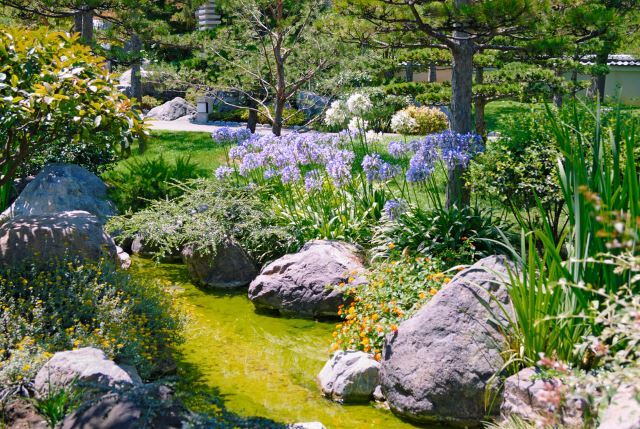 Gardening is meant to be a Zen experience, so these gardens always invoke that sense into the landscape. Adding tiny essential elements like that little house and trees are a great way to create a completely unique garden area. You don’t need two tickets to paradise when you can create it in your own backyard. This garden idea brings the best of a tropical paradise right to your back door. Plenty of tropical plants, palm trees and a great water feature can easily invoke an island getaway. Add an outdoor tiki bar and some barbecue pits, and you’ve practically created your own resort. 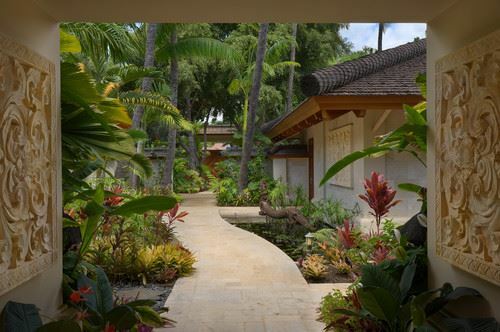 The rock pathway that cuts into this tropical garden escape is a great addition that really ties the space together. 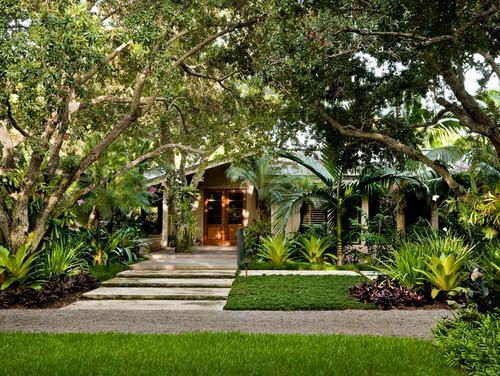 Make your outdoor space look like a jungle by incorporating plenty of trees and lush plant life. With so many tropical elements in this garden idea, it’d be hard to miss the point of the theme. Tropical plants usually don’t require too much water or tending, but can grow wildly out of control if you don’t check up on them regularly. 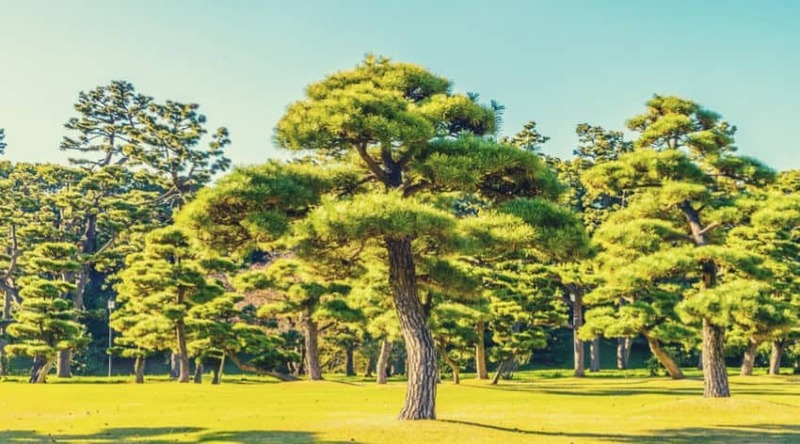 By using plenty of trees, you can easily help reduce plant roots from spreading out over your entire outdoor space and wreaking havoc on your other plants. 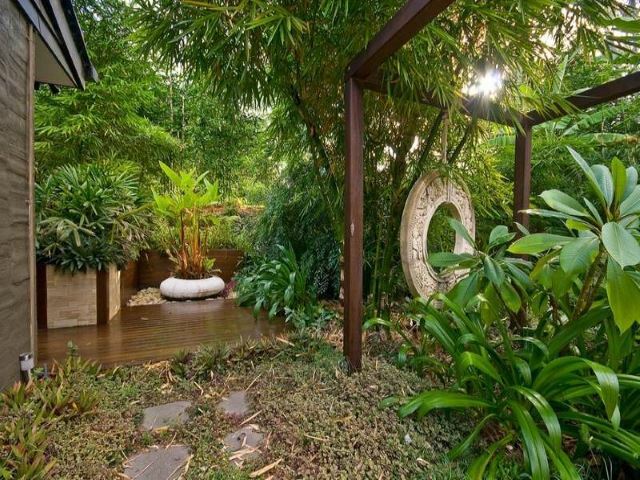 Imagine sunbathing in this garden landscape reminiscent of a resort straight from Bali? The best thing about planning out a landscaping idea is that you can invoke any style, country or theme you want. When you’re going for that tropical landscaping theme, incorporate plenty of elements you’d find in your favorite tropical places such as plants, vines, flowering bushes, trees and other elements. In this gorgeous design, the actual carvings of the stone garden walls make this scene exquisitely tropical. Some of the greatest things about using succulents in your landscaping idea is that they do well without a lot of water and they grow really quickly. They also look naturally tropical and can invoke that sense of paradise easily into any landscaping plan. 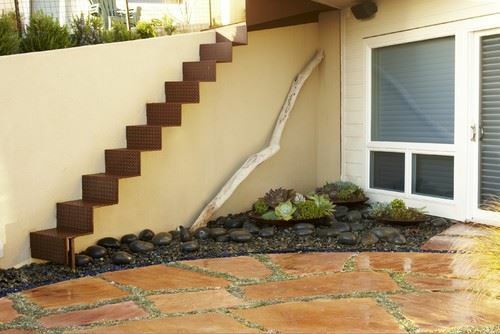 With this pathway idea, succulents help line the edges of the walkway and create a Zen space. Those great palms sprouting above the scene give this garden idea an extra feeling of paradise. Incorporate unique designs into your tropical garden landscape to create a fun area for guests to walk through. 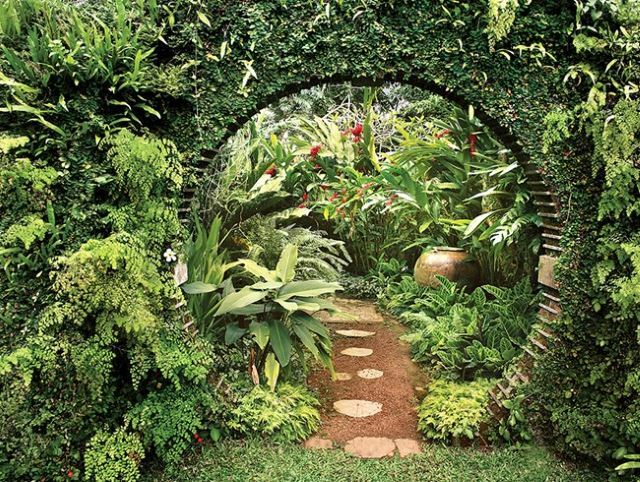 As pictured, this circular entrance way is lined with creeping ferns and vines. The more plants, the better when it comes to establishing a tropical theme in your garden. You can easily incorporate plants necessary to make your space look like a little slice of paradise despite your location. Any landscaping store can help you make the appropriate selections. Whether it’s Asia you’re trying to channel or another area of the globe, adding elements that cater to the theme are important. In this photo, this garden is decorated to fit that Asian feel. The minimalistic wooden garden frame and that massive decorative coin help make this space adhere to the theme so you aren’t lost. Often times, plants can do this on their own, but you can definitely add those extra steps to make your garden theme prominent. Make your garden tropical and magical by using plenty of ethereal plants and decorative elements. 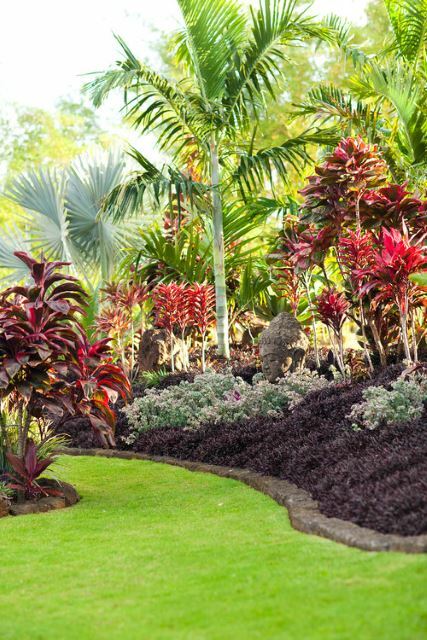 In this tropical garden idea, decorative stones and vividly colored plants really make this scene pop. The sun hitting the plants only make their unique colors stand out even more. 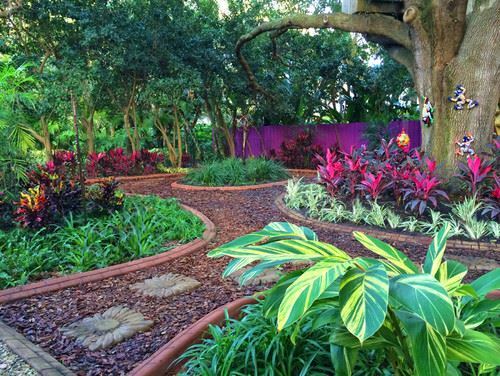 Colors really are important when determining the layout of a garden, tropical or otherwise. Using elephant ear ferns or any plant with wide leaves like the ones depicted can help add to the tropical feel of the space. Roses by themselves are a classic and traditional flower – if not THE most classic flower on earth. 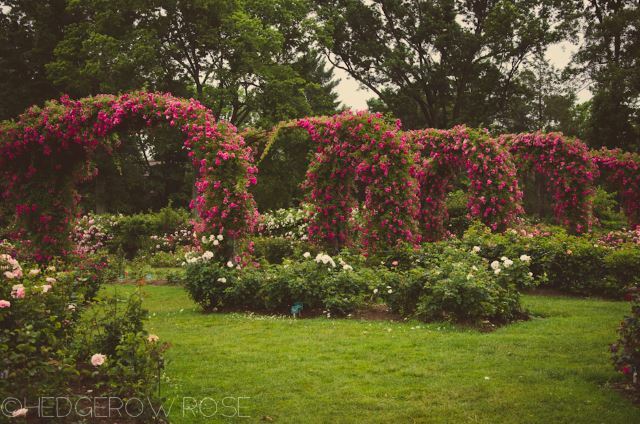 If you need to make a more formal garden space, you can’t go wrong with the unmistakable elegance of the rose. Rose bushes tend to grow very quickly and if cared for properly, should produce full roses almost all year long. 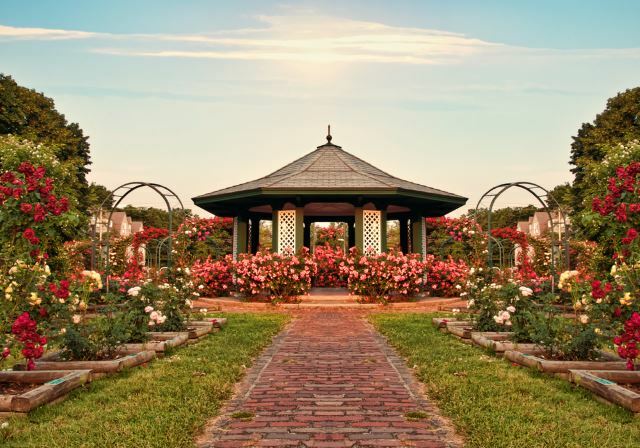 In this garden idea, a courtyard-like theme is inspired by these clean rows of rose bushes and elegant land décor. Imagine how great this garden smells? There are roses everywhere! Using roses grown into hedgerows is a classic look that royalty throughout the world has used in their own formal gardens. Whether you’re planning a formal garden or just want a classic rose element, you cannot go wrong with these great walls of roses. Smaller blooms typically grow easier and can adhere to hedges a bit easier than the standard sized roses. 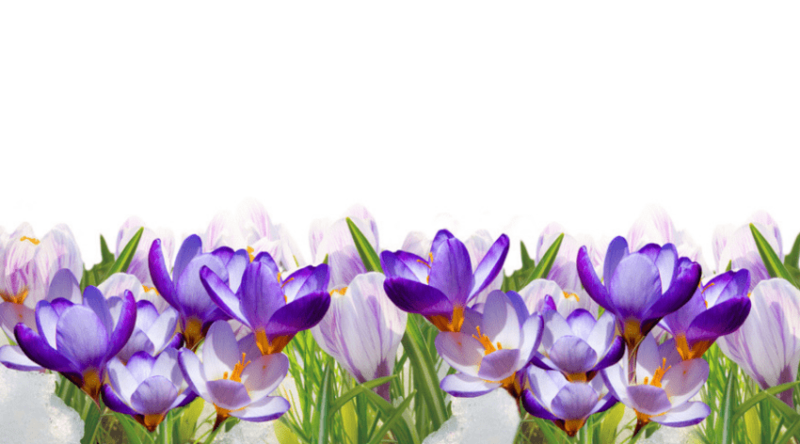 Add different colors in blooms to the space to create a wonderful garden of color and smell! 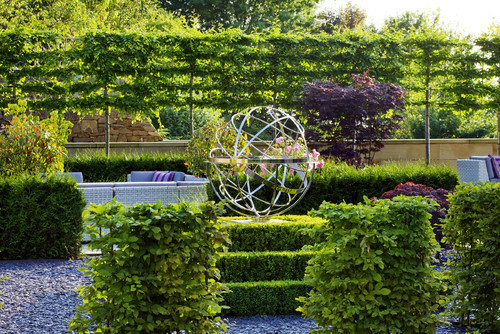 *You might also like: 63 of the Best Landscape Hedge Ideas: #39 is Awesome! Delicate little buds open up under the bright sun in this great landscaping idea. This is a wonderful idea to keep in mind if you have a covered pathway you’re not sure what to do with. The pink blooms in this photo look absolutely gorgeous, but one of the best things about roses is how colorful they can be. Mix and match colors, or experiment with different shades within that same hue to create your own distinct rose covered path. Your eyes and nose will thank you for it. 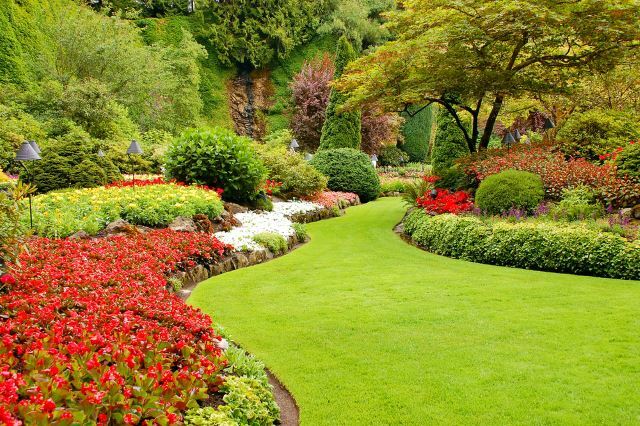 As you can tell, there are so many great garden ideas out there! Don’t let the size of your outdoor space overwhelm or underwhelm you – you can easily create most of these ideas to scale no matter what the size of your landscape is. 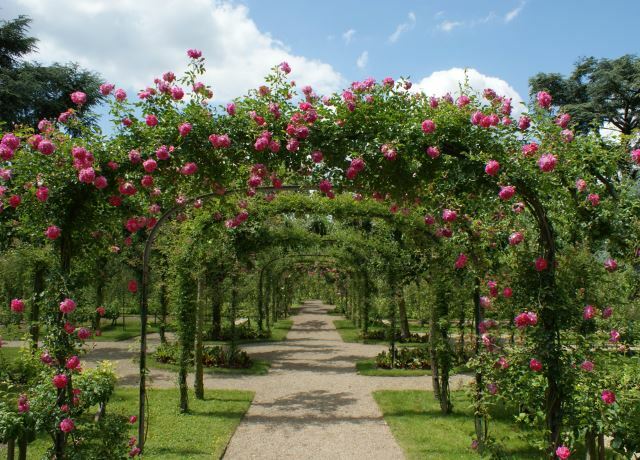 Create a babbling rock brook or a covered pathway for a wonderful canopy of roses. Feeling more tropical? Plenty of palms and ferns are your go-to items for that project! These are just a few ideas for you to skim over, but you can utilize all sorts of different elements and designs to create your own fantastic garden. So get out there and start planning! Let us know how it goes by commenting on your progress or posting pictures! Good luck and happy gardening.